I am growing a little tired of the coding narrative. Suggesting everyone should code seems quite trivial without any fundamental research as to why we should all be doing that and leaves me feeling offended. I’m suggesting that we look beyond coding. 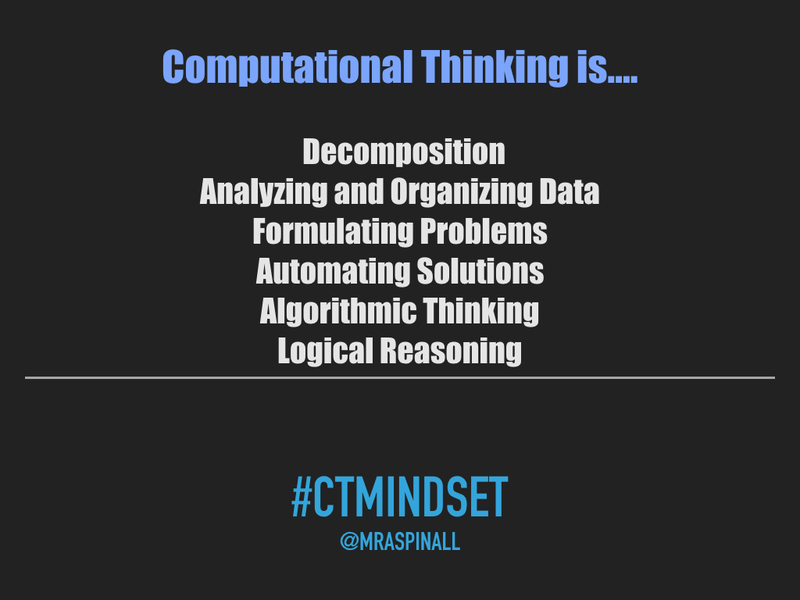 Coding is a snippet of computational thinking, which is far more important. I want people to realize that the concept of coding happens all the time in many classrooms. Kids tinker, make, solve problems, collaborate and challenge each other all the time. I’d argue that most teachers already do most of this list, without the awareness. The Hour of Code movement is great because it raises awareness but does little from the aforementioned list. HOC is a superb entry point but not a destination. Coding isn’t the only way to demonstrate these skills – and technology isn’t even required. I’ve been pushing coding for close to a decade now and am pleased to see it finally get some traction (and there were many before me). Now it is time for a next step. 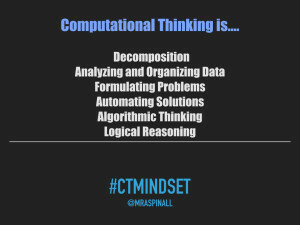 As such, I am proposing a new hashtag #CTMindset (Computational Thinking Mindset) to remind us how people think, computers think and technology works. If we can combine the three, maybe there is some hope.